As we open Part 8 of this series, it will have become clear to most readers that I swung for the fences on this project. The two ServoStiks I purchased prove the point: they can switch between 4‐way control and 8‐way control. Did I need this? No. Was I going to take advantage of it once I bought them? Of course. Today you’ll learn about how I stole another feature from LEDBlinky: the ability to switch the ServoStiks between 4‐way control and 8‐way control automatically as a game requires. A joystick has four microswitches on it, each of them nearly identical to the switches on arcade buttons. Very old arcade games that used joysticks featured 4‐way control — usually the cardinal directions. The hardware wouldn’t allow the joystick to hit the corners, so the programming didn’t consider what would happen if two of the microswitches were engaged at once. Later games began to feature 8‐way control — they anticipated these in‐between directions and interpreted them as diagonals. On many joysticks, a restrictor plate of a certain shape defines how the joystick can travel — for example, whether it’s allowed to hit the diagonals or not. To over‐simplify: an 8‐way joystick has a round restrictor plate, and a 4‐way joystick has a diamond‐shaped restrictor plate. The ServoStik is based on a joystick called the Sanwa JLW which allows for the mode to be determined solely by rotation: with the diamond shape it can’t reach the diagonals, but rotated 45 degrees it can reach all eight directions. Out of the box, the JLW’s restrictor plate needs to be adjusted by hand to switch modes. The ServoStik adds a motor so that the rotation can happen without having to crack the cabinet open. Rube Goldberg would be proud. On the ServoStik, the diamond shape prevents the joystick from engaging two microswitches at once. Ordinarily, the ServoStik’s control board plugs into a computer via USB and is treated like an HID device just like the Pac‐Drive. But my original plan was to use a hardware toggle switch to select joystick mode. With this in mind, I followed the instructions on Ultimarc’s site to perform a one‐way conversion into “hardware mode.” This mode eschews HID protocols and allows the joystick to respond to a voltage signal. Here’s how it works: take an ordinary USB cable. Strip the insulation somewhere in the middle and you’ll see four wires. Keep the red and black wires intact; those deliver power to the joystick. But cut the white and green wires, strip some of their insulation, and wire each end into a hardware switch — or into two pushbuttons. I am great at Fritzing. When the green wire’s circuit is closed, the ServoStik will switch to (or remain in) 4‐way mode. When the white wire’s circuit is closed, the ServoStik will switch to (or remain in) 8‐way mode. I’d launch a game that obviously required 4‐way control, like Pac‐Man, but I’d forget to switch the joystick’s mode. I’d launch a game like Pac‐Man, remember to switch the joystick into 4‐way mode, but forget to switch the mode back to 8‐way when launching the next game. I’d launch a game but be unsure of whether it wanted 4‐way or 8‐way input, and hence not know which way to flip the switch. As I should’ve realized at the time, any plan that requires me to remember to do something is fatally flawed. Once I changed my mind and decided to trigger the mode‐switching via software, I felt a bit stupid for having so boldly made the irreversible “hardware mode” change. But then I remembered: a Pi is more versatile than your ordinary PC! Anything a simple toggle switch can do mechanically is something I can do in software via GPIO. This series has already made us into GPIO experts. I desoldered the ends of the white and green wires from the hardware toggle switch. I trimmed the ends that went toward my power source and covered them with heat‐shrink tubing; I wouldn’t need them anymore. The ends that went toward the ServoStik’s control board got soldered to extension wires. Those extension wires were connected to two spare GPIO pins on my Pi. 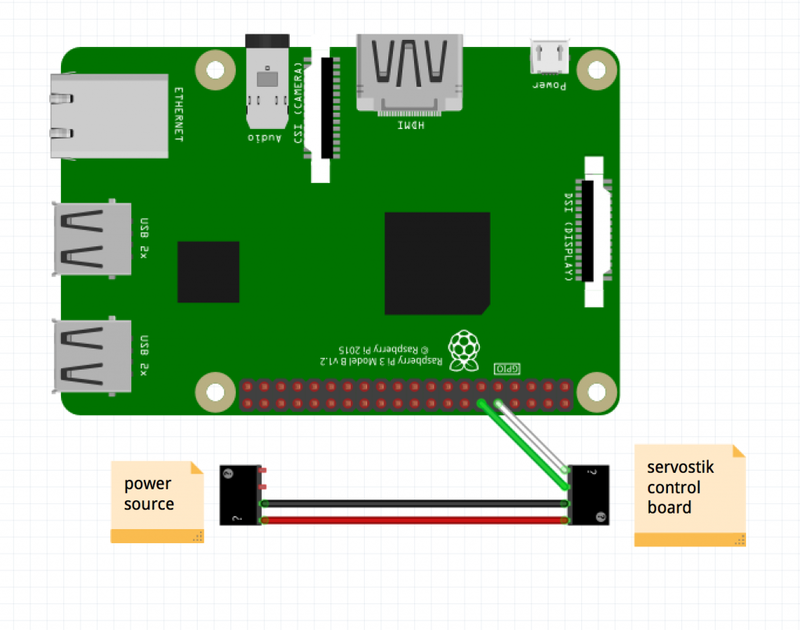 The Pi takes over communication with the ServoStik control board. And that’s it. Hell, I had to strain to make three steps out of these directions. The rest can be handled in software. I put the green wire on pin 5 and the white wire on pin 6. So to trigger 4‐way mode, I set pin 5 high and pin 6 low; to trigger 8‐way mode, I set pin 5 low and pin 6 high. That’s it. Why did I choose pins 5 and 6? The usual reasons: they were open and adjacent. Pick whichever pins you like. A script for setting the ServoStik to 4-way mode or 8-way mode. # Zero equals a shrug. Put the joystick in 8-way mode. Save this script as /home/pi/bin/set-joystick. Now you should be able to do set-joystick 4 to trigger 4‐way mode and set-joystick 8 to trigger 8‐way mode. This might be the simplest thing we’ve done via GPIO so far. All the control board needs is a momentary signal change to trigger the joysticks, so we don’t have to run a daemon like we did for other tasks. We can just run this script on demand. So we’ve solved how to control the switch via software. But we still need a system to keep track of which mode goes with which game. That sort of information would be easy to look up on the spot. I can create /home/pi/controls/, populate it with one subdirectory per system, and then have one config file per game — just like I did in Part 7 for button configs. So RetroPie could consult /home/pi/controls/arcade/pacman.cfg, read a 4 as its only contents, and know that the game needs 4‐way mode. And, again, with only 100 games, I could create each config file by hand. It’s not that much work, and I’d have to do it only once per game. But why do 30 minutes of gruntwork when you can take 60 minutes to write a script to automate the task? The controls.dat project, now dormant, aimed to provide metadata about the control scheme of each game that MAME supported: how many buttons it used, how each button was labeled, whether it used a joystick or a driving wheel or a trackball or something even weirder than that, and so on. This sort of information was of no use to me in Part 7; knowing which buttons to light up required me to document how I had chosen to map a game’s controls onto my own buttons. But all I need to know here is 4‐way versus 8‐way. That’s an immutable fact of the game itself. The actual controls.dat file is in INI format and it’s weird and gigantic. A kind soul maintained (at least for a while) a companion project that represented that same data as JSON. The data file would still be gigantic, but not nearly as weird. We’ll grab the restructuredControls.json file from that repo and place it inside the arcade config directory (/home/pi/controls/arcade). The joystick-type script will first try to look up the game’s config file. If that file exists, we’ll use it as the single source of truth for a joystick’s mode. If that config file does not exist, and we’re launching an arcade game, we’ll dig through our gigantic JSON file to see if it has any information about that game’s control scheme. If so, we use its verdict to create a config file for that game. That way we never have to do that bookkeeping work again for that particular game. When a game launches, we’ll put something in runcommand-onstart.sh that takes the output of joystick-type and gives it to set-joystick. The script isn’t fascinating enough to dump into this article; you can read the joystick-type file in the gist if you’re curious. The usage is simple: joystick-type arcade pacman, for instance, should print 4 to STDOUT, and joystick-type arcade sf2 should print 8. Last time we were able to take the complex task of per‐game button illumination and condense it to one line of code in runcommand-onstart.sh. I was not as elegant this time around. I assume you’ve read Part 7, so I won’t re‐explain runcommand-onstart.sh and runcommand-onend.sh. The code below should go in /opt/retropie/configs/all/runcommand-onstart.sh — create it if it doesn’t exist. # Figure out the joystick mode of the game. # If the joystick type needs to be switched to 4-way mode, notify the user. # in an interactive shell. Investigate. If you implemented Part 7 to the letter, runcommand-onstart.sh will already exist, and the first section of this file will be redundant. In that case just include the part below the ###. We assume that we’re already in 8‐way mode (because runcommand-onend.sh will ensure that we are when it exits a game). We call the joystick-type script and capture its output into a variable. It ought to output a simple 4 or 8, but we strip whitespace just in case. When the return value is 8, we do nothing, because we’re already in 8‐way mode. When the return value is 4, we leverage a tool called dialog to show some text on the screen in a prettified manner. (RetroPie uses dialog extensively.) We explain that the joysticks are switching to 4‐way mode and then pause for a moment so the user can read it. # Return the joystick to 8-way mode no matter what. Again: omit everything above ### if your runcommand-onend.sh script already has it. Once again, here’s a gist with all the code samples. This video won’t be as compelling as the last one, but it at least demonstrates that I really did do everything I just described. Once Pac‐Man launches, the joysticks switch to 4‐way control. Not really. I don’t doubt that Pac‐Man is somewhat vexing to play with an 8‐way joystick, but I do doubt that it would’ve caused me more distress than this project did. A ServoStik needs a lot of feeding and watering. The restrictor plate has to be held against the bottom of the joystick tightly enough to make the stick feel sturdy, but loosely enough that it can be rotated ninety degrees by a rather small motor. To pull this off it employs some machine screws, springs, and nylon washers, but it won’t work perfectly out of the box. Invest in some WD‐40. Another option would be to install two ordinary 8‐way joysticks and chill out about the whole thing. We’re nearly out of hardware‐related topics, so I’ll talk about the scripts I wrote for miscellaneous tasks like checking game metadata and testing my controls. Pedants will enjoy Part 9! I accomplished the same thing by building my own servo controlled joystick. Modified the joystick back plastic plate to attach a servo to and auto change the joystick mode. Plugged it into the GPIO. Wrote a python program to activate the servo. That then changed the joystick back and forth from 4-Way to 8-Way. Then I used the runcommand-onstart.sh. Stored argument $3 to a variable. Striped the path and file extension leaving just the rom or game name. Did a case statement to determine which game needed which joystick setting then called one of two python files to change the joystick before each game. It turned out awesome. My wife is an expert from the retro arcade ms pacman times and could not play the game in 8-way joystick mode. Once set to 4-way she said its just like the old school cabinet. The diagram above, labelled “The Pi takes over communication with the ServoStik control board.” shows connections to what I believe are GPI013 and GPIO6, and not GPIO5 and GPIO6, as stated in the text. Wuuld you agree? The script ‘joystick-type’ in the Github site sets variable ‘SYSTEM_PATH’ using variable SYSTEM, but variable ‘SYSTEM’ is not set until afterwards, so the first variable assignment fails. I’ll report again as I continue to sift through your code. Further to my first comment, re: GPIO pins: Upon further investigation, I believe the two pins you used are/were UART0 Tx and UART0 Rx. Is this your intention, and if so, why? Ian, you’re right about both mistakes. I edited the gist to correct the ordering of those two lines. By sheer luck, I’d saved the original Fritzing diagram, so I fixed that as well. Thanks! On pinout.xyz, the UART pins are listed as BCM 14 and 15. I chose BCM 5 and 6 for no particular reason; they’re adjacent to pins that I’m using for my volume knob. You, sir, are AWESOME!!! The PC in my barrel arcade died coincidentally just after I bought a Raspberry Pi Zero to play around with. Since I was only running 8bit games, I thought I’d use it to replace the PC. I tried to install and use RGBCommander but it doesn’t work on the Pi Zero. I then tried to install the linux drivers from Katie Snow (pointed to from the Ultimarc website) but couldn’t get that going either. With your instructions and scripts, my servostiks are now working perfectly! Thanks!! !